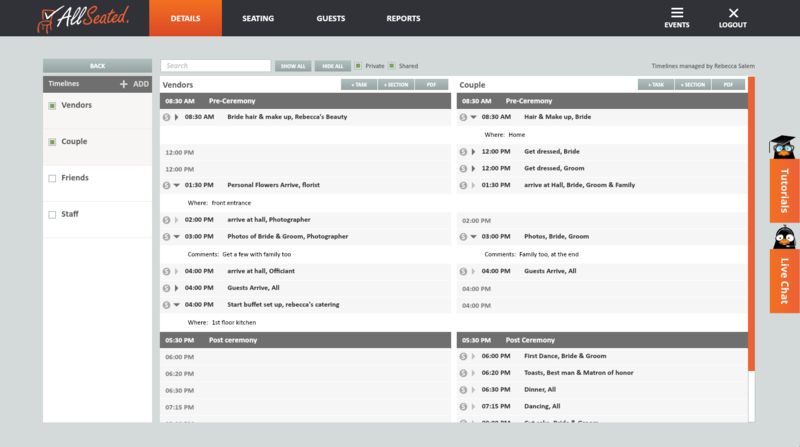 AllSeated’s Event Planning Tools are perfect for organizing and planning every type of event. There are many planning benefits to using AllSeated’s Event Planning tools including the ability to manage your guest list, floorplans and seating arrangements all in one place while saving you hours of time in the process. AllSeated gives you peace of mind as all of our floorplans and furniture pieces are built to-scale. Using our event planning tools to arrange your seating and floorplan layout within AllSeated ensures that your expectations are met the day of your event. Easily design your floorplan to scale within your AllSeated account. Choose from a wide variety of table and furniture styles from the AllSeated furniture library. 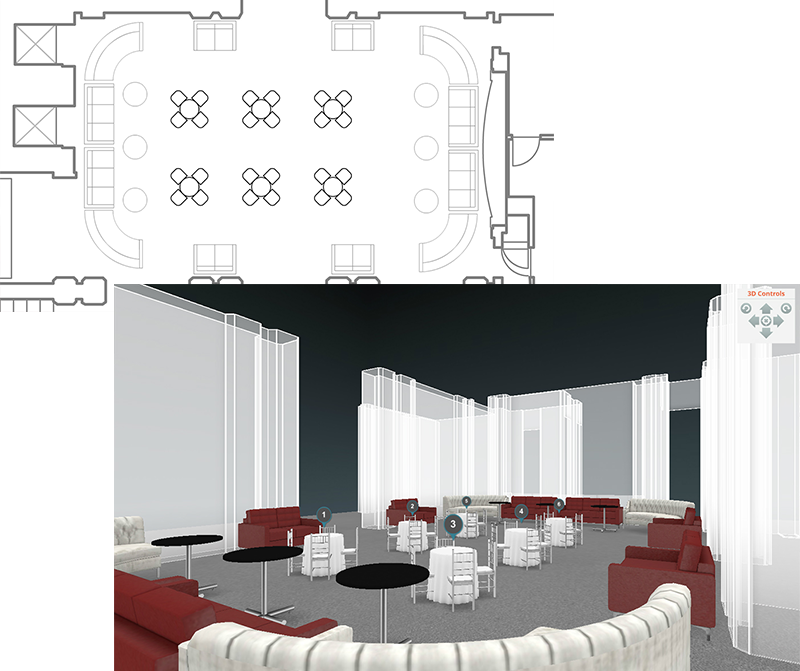 Build your floorplan layout using AllSeated’s event planning tools by selecting the appropriate table shapes and dimensions needed for your event. Customize the spacing between tables, number of chairs around each table, table numbers, and table assignments. All details can be modified and changed with just a few clicks of your mouse at any time. Once you have designed your floorplan, you can link to your guest list in order to create your seating chart. AllSeated allows you to seat your guests at tables with the option to even assign individual seat assignments at each table if desired. AllSeated’s event planning tools provide for easy collaboration regarding the details of your event. Invite your close friends and/or family members into your account for help with things like entering guest information, opinions on your floorplan and assistance in arranging your seating chart. 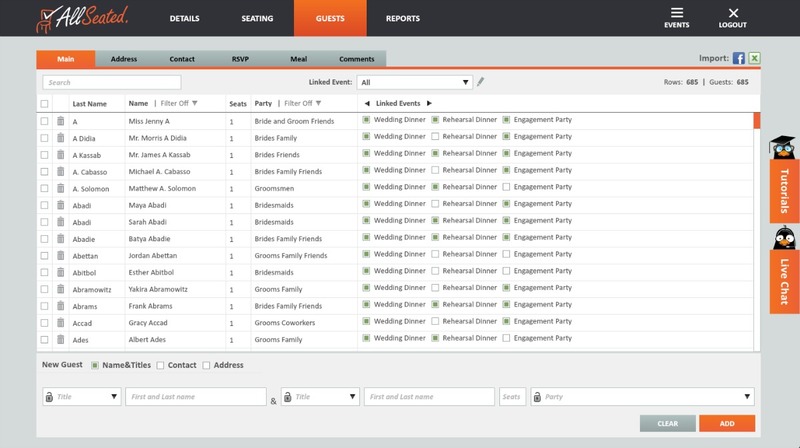 AllSeated’s event planning tools include the opportunity to create multiple timelines for an event. In addition to creating a day of timeline for yourself to keep track of beauty appointments and your schedule of events leading up to the affair time, you can also create a timeline for your vendors. Collaborating with your vendors within a vendor timeline will keep everyone working from the same page regarding your event. The collaborative aspect of AllSeated’s event planning software with everything updated in real-time helps to keep everyone current on all event details. Available through download in the App Store, our Day-Of App for tablets is an extension of AllSeated built specifically to use the day of your event. AllSeated’s Day-Of Mobile App for tablets allows you access to your event with many on the go features! A Full Check-In System lets your guests know where they’re sitting. Simply enter a guest’s name and their seating assignment pops up! AllSeated’s Day-Of Mobile App provides real-time collaboration, live check-in updates, an overview of check-in status, and the ability to view your floorplan layouts in both 2D and 3D.